This is how I start,using all the wire colours from OEM harnesses rebuilts for this very special wire harness I've mentioned above. So-have done the short road-wire this weekend for side Rads,i went for only one main fuse,got rid of the bank angle sensor+relays therefore,got rid of the high-beam relays,that doesnt mean i've got no high beam,it means i've used a simple 0.5$ I-0-II switch,which you can exchange in 47 seconds for 50 cent when it's burned after 5 seasons on road. IMPORTANT: I havn't checked it,these comments work at European Models, probably for US Models also,but-I havn't ckecked it,please compare diagrams. 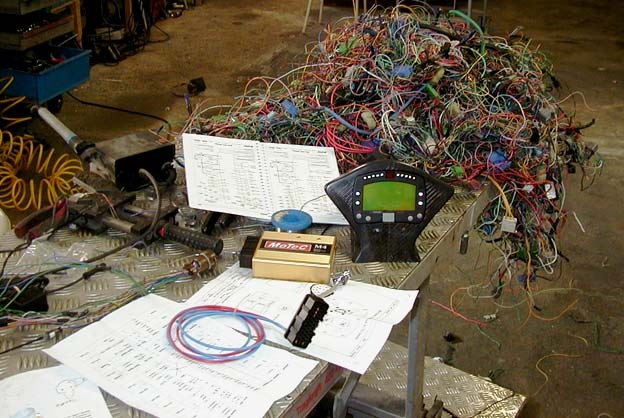 1:don't mix up the 2 different Pink/green wires coming from ECU,have a closer look at the wiring-diagramm. 2.if you want to get rid of the fuse box: the green-white and the green-red ECU wire you can put together and then on ground (green),that'll allow you to get rid of the clutch-switch,side stand-switch! 3:the neutral light green wire you can connect directly with the instrument-panel lightgreen/red wire. 5.use the bank-angle sensor Relays as main relais for Power-supply,this will switch main+ ,means you can choose a brown,brown/black or red wire for main+ then.Pay attention you've got enough mm2 for wire.Think of only the fuelpump and headlights need real electric power . 7.If you want to keep your bank angle sensor,simple:the white/black connect (put on)with the thin black wire coming out of green plug of starter switch (it's necessary,that the bank anle sensor electronic is still on + when main power realais has cutted of the power supply for the other Electronics), the orange/red with orange/red of relay,the green on ground. The thin black wire of Bank angle sensor relays is going up to the green plug of Engine-start switch unit:.Coming back out of the switch is a thin white/black wire-this you have to connect with Battery +. (Attention,what i'm talking from: NOT the wire-colours from Switch to green plug, i mean the colours FROM green plug into main wire harness,important because (don't know why Honda did this) the black/white changes into black and reverse -before/behind green plug. So,began with the 2nd RC51,from Zero all again,but now i made some Pics for you of the Wire-loom-mods growing,means,where you can start and how (not necessary should..). Bending,sawing ,filing, thats maybe not for everyone,but it's easyer done and faster,if you know,where to start. Therefor use the std.front ignition Coil-bracket,tighten it only with one screw-no Problem. Make a thread into Frame,i've cutted out the rear std.Bracket from Subframe to be faster. the weight effex: 1.7 kg less weight,not included secondary effects as battery cable lenght,missing switch ,ignition cable lenght,minimum of holders,etc. somehow you've to begin: attention download ! !